LAS VEGAS -- About 75 new ultra high definition (UHD) televisions are expected to be showcased here at CES this week, along with promises by content providers of more 4K digital content to feed them. UHD-TV offers almost four times the resolution of mainstream 1080p flat screens, and about 500,000 of them are expected to sell in the U.S. this year, according to the Consumer Electronics Association (CEA). That's up from 60,000 UHD-TVs sold in the U.S. last year. BY 2015, that number is expected to more than double to 1.25 million sets. Steve Koenig, director of industry analysis for the CEA, told reporters and analysts at CES on Monday that high-definition 1080p LCD TVs (HDTVs) will continue to dominate the market for the next several years. Televisions with 55-in. or larger screens, expected to be the best-selling models, will make up 66% of flat screen shipments in 2017. UHD-TVs will represent 34% of the market in that year. LG's new 105-in curved screen UHD-TV on display at CES. After several years of decline, television sales are improving as new devices spur consumers to change out their first HDTVs with newer models. According to Koenig, the refresh cycle for televisions is about eight years. Because UHD-TVs offer 3840x2160-pixel resolution -- twice a typical HDTV's 1920x1080-pixel resolution -- set makers are creating larger screens so consumers can appreciate the better picture quality. In general, consumers can expect to see an uptick in 60-in. and larger televisions. "It's safe to say 60-in. is the new 50-in.," Koenig said, referring to what has been one of the more popular TV screen sizes. "If they [consumers] can get a larger screen with less features, most will take that." Unit shipments of televisions under 40 inches in size are shrinking fast, while screen sizes between 45 inches and 60 inches will grow 24% to 33% by 2017. Also losing steam: 3DTV. Three-dimensional imaging has been a standard offering in most late model 1080p HDTVs, but Koenig said he expects manufacturers to either drop the add-on technology or simply include it as a bundled feature. "The industry is really starting to back away from this technology," he said. 3D TV appears to be a fading fad. Every major TV manufacturer announced UHD-TVs at CES, with most unveiling screen sizes ranging from 55 inches all the way up to 110 inches. Most also announced curved screen OLED (organic light emitting diode) UHD-TVs. While buyers still pay north of $50,000 for a 105-in. UHD-TV, the average price for a 55-in. model this year will be around $2,750, according to the CEA. By 2017, that price is expected to drop to $1,850. "Panel makers have made a lot of strides toward bringing panel costs down compared with 1080p panels," Koenig said. At the same time, flat-screen plasma HDTVs are expected to fade to black in the U.S., Koenig said. "In the U.S., limitations in screen size and economies of scale with LCD make it difficult to endorse plasma as being part of the industry for very much longer," he said. Panasonic, one of the largest plasma screen makers, announced late last year that it will end the production of plasma display panels (PDP) and shutter three factories that were building the HDTVs. "We may see Samsung and LG stick with it and fight the good fight," Koenig said, adding that those sales will be small in comparison to those of LCD sets. Meanwhile, manufacturers such as LG, Panasonic, Toshiba and Sony all touted new lines of UHD-TVs or OLED UHD-TVs, with 75b different sets being unveiled -- including several 105-in. curved-screen UHD-TVs. 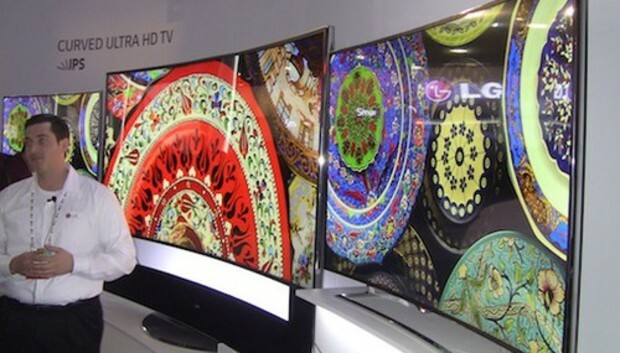 Late last year, LG and Samsung began an expansion of their respective OLED production efforts. LG increased production by 60% to 70% and Samsung boosted its production 40% to 50%, Koenig said. With those kinds of increases, prices could drop by as much as 20% this year, Koenig added. LG unveiled a flexible OLED TV on Monday, while rival Samsung announced 14 UHD-TVs, including its own line of OLED UHD-TVs. Model sizes included a 77-in. version, a 65-in. model and one with a 55-in. screen. Samsung also took the wraps off four curved UHD-TVs, including what it called the world's largest: a 105-in. model with a 21:9 aspect ratio and 11 million pixels sporting a 5,120—2,160 screen resolution. Samsung also displayed a "bendable" OLED UHD-TV. That 85-in flexible prototype has no launch date yet. Watch closely and you'll see Samsung's OLED UHD-TV bend out and then back in. Sony announced three UHD-TVs, including the company's new flagship 55-in. and 65-in. XBR 4K Ultra HD sets that sell for $2,999 and $4,499, respectively. An 84-in. version carries a much steeper price tag: $24,999. While OLED UHD-TVs offer some of the best color, clarity and resolution of the bunch, they will not likely catch on for some time. In fact, by 2017, they're only expected to make up 6% of the UHD-TV shipments or about 2.3 million sets, compared with LCD TVs, which will make up 92% of the market; the other 2% will be projector televisions, CEA said. Most major television vendors at CES also showcased smart TV technology, with manufacturers displaying both UHD-TVs and HDTVs that offer better integration with the Internet and Web 2.0 features. The TVs showed a wide variety of interactive media, Internet TV, as well as on-demand streaming media and home networking access. Panasonic and Mozilla today announced a partnership to develop and promote the new Firefox OS, an open platform based on HTML5 and other Web technologies, for next-generation smart TVs. The development of the new Firefox OS platform aims to deliver more expansive access into smart TVs by leveraging the HTML5 and Web technologies already prevalent on PCs, smartphones and tablets. The goal is to offer consumers more personalized Web browsing and broadcast content through the Internet. Panasonic's next generation of smart TVs, which were on display at CES, will gain full compatibility with Web technologies and HTML5 standards used for cloud services and various future networked devices. By using Mozilla's Web APIs for hardware control and operation, next-generation smart TVs will also be capable of monitoring and operating devices inside and outside of the home, such as the emerging smart-home appliances. Panasonic's UHD Smart TV comes with Web browsing and native media streaming capabilities. Samsung's TVs are also becoming smarter, with a new Multi-Link feature that brings contextual multitasking to the big screen, as well as a newly designed Smart Hub that allows users to play video games from leading partners such as such as Electronic Arts (EA) and Gameloft. In order to spur adoption of UHD-TVs, content providers -- streaming media services and movie studios -- have partnered with display vendors to bring more 4K content to viewers. Cable provider Comcast, Amazon, and and pay-as-you-go digital movie and TV streaming service M-Go this week announced a partnership with Samsung Electronics to deliver 4K UHD content to 2014 Samsung UHD TVs. Comcast said that later this year, its Xfinity TV customers with Samsung UHD TVs will be able to launch an Xfinity TV 4K app that will allow consumers to stream, via the Internet, a limited amount of 4K movies and TV shows On Demand. Comcast said it is also working with NBC Universal to offer 4K UHD choices for the Xfinity TV 4K app. Amazon's Instant Video service is partnering with Hollywood studios and TV companies, such as 20th Century Fox, Warner Bros., Lionsgate and the Discovery Channel to offer users premium 4K video. At a Sony news conference this morning, Netflix CEO Reed Hastings announced that all new Netflix original programming will be shot and finished in 4K in anticipation of the expansion of UHD streaming content. Netflix said it will kick off its 4K content by streaming House of Cards in the higher resolution.